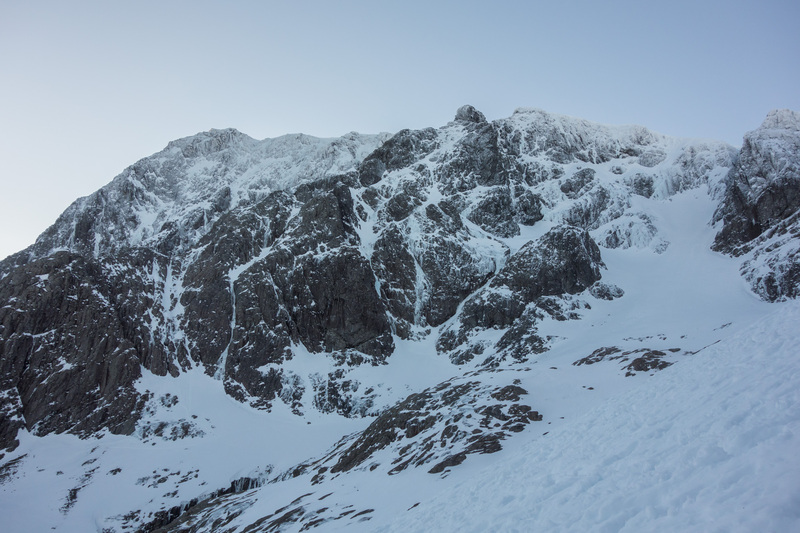 The cliffs of Ben Nevis and some of the surrounding peaks are currently in fantastic condition for ice climbing, with many of the classic lines well formed thanks to the gentle freeze-thaw cycles they have experienced. 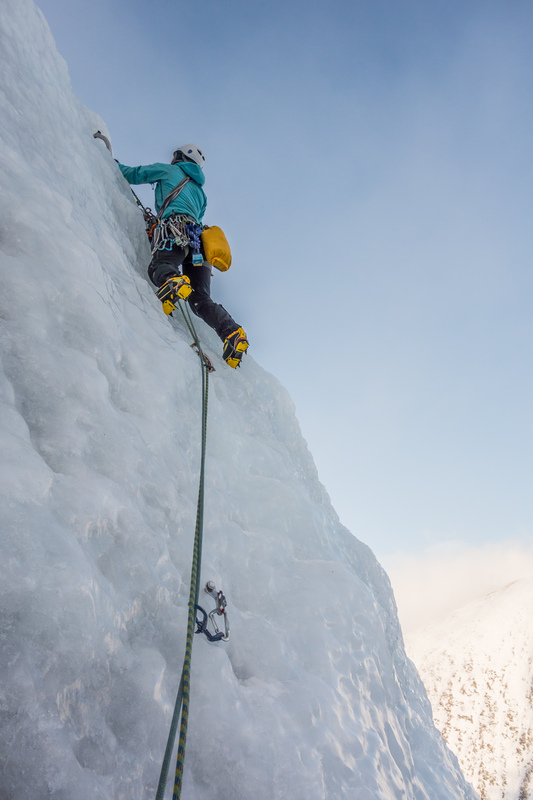 After cancelling our planned trip to Setesdal in Norway, due to an unusually warm winter and poor ice conditions, it made perfect sense to relocate to Fort William instead and sample some of the superb climbing on offer a bit closer to home. We headed over from Aberdeen after work and arrived at our luxurious chalet in the prestigious Linnhe Loch-Side Caravan Park full of excitement. Ric and Tom joined us after a flight up from London that evening and with a superb forecast for the next day we set our alarms for stupid-o-clock and tried to get some sleep. We awoke to starry skies and after smashing copious quantities of porridge stumbled up the footpath towards the north face of The Ben. Arriving at the CIC hut beneath the cliffs just as it was beginning to get light, we were met with fantastic views of the crags, draped with snow and riven with blue drools of ice. Debs and I decided that given the amount of relatively low-level ice on the mountain we would try and get some mileage in and tick off some routes that don’t remain in condition later in the season. 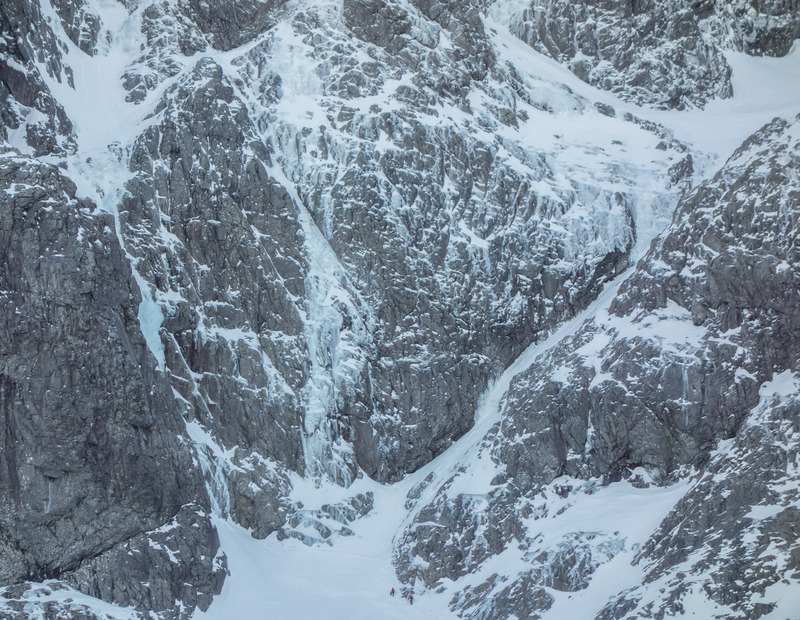 We headed up to the superb cascade of The Curtain (IV, 5) while Ric and Tom wandered round into Observatory Gully to see if they could beat the crowds to the arch-classic Point Five Gully (V, 5). I had wanted to climb The Curtain ever since I first bought the Scottish Winter Climbs guide book and saw the frontispiece picture of a climber leading a dramatic thin smear of ice. Thankfully on our ascent the ice was considerably thicker and took ice screws where needed, which made the whole experience a lot more relaxing! 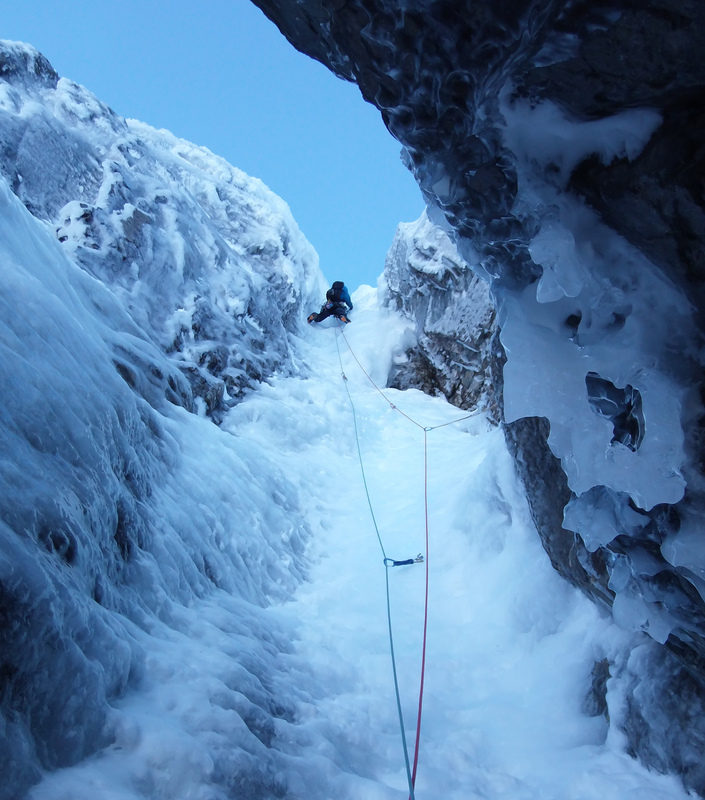 The first pitch ascends a ramp that maintains a constant friendly angle for around 45 m before finishing at a comfy belay stance in an ice cave below the steeper sections. As one climbs the ramp the sense of exposure gradually increases until you realise what an outrageous situation you are in! 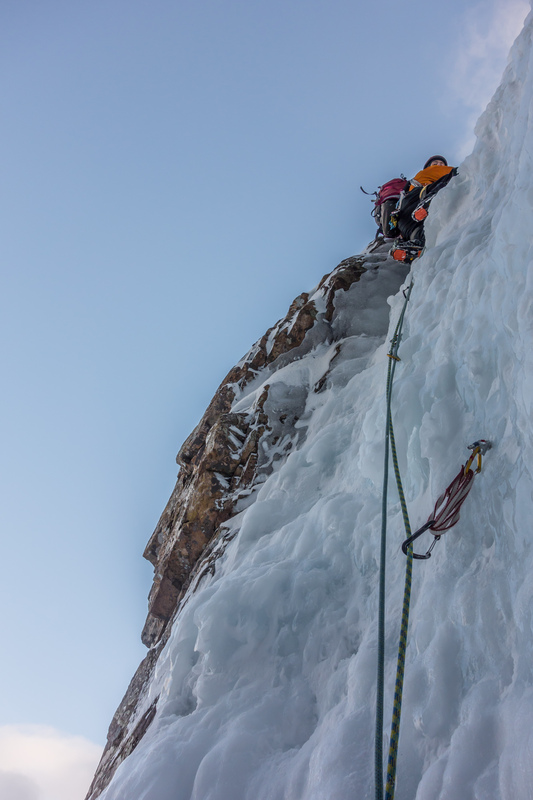 The second pitch is a short one and involves a traverse out of the ice cave and a steep 10 m section of tech 5 ice before another traverse leads to an in-situ belay on a small ledge. 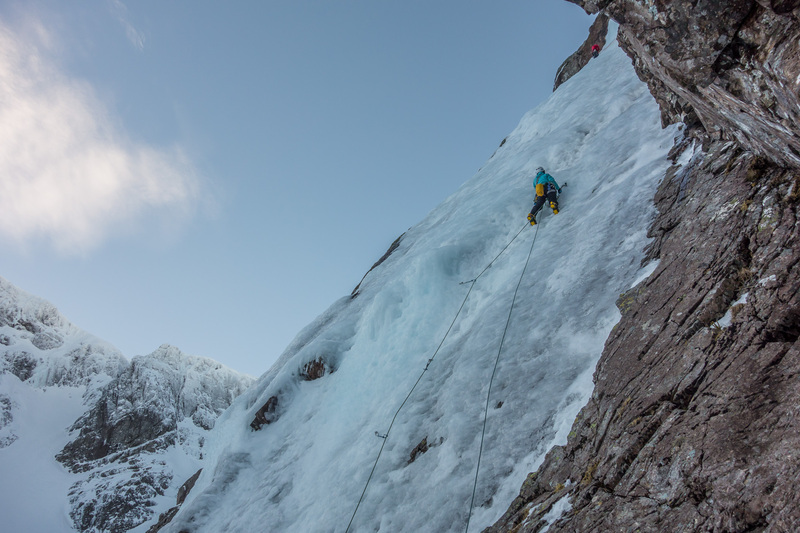 The second traverse was tricky in the current conditions – the route had seen so many ascents of late that the ice had disappeared from the slab above the ledge leaving nothing for the axes. Finally, the last section requires a rising traverse on ever-steepening ice to reach easier ground and the snow terrace above the route. Debs dispatched this with no drama and we headed down Ledge Route into Number Five Gully and so back to our bags. While we were climbing The Curtain the weather changed for the worse and the cloud rolled in and wind picked up. Not to be deterred completely we decided that a shorter second route was in order before heading down. We walked across to the other side of the coire to a route on the West Flank of Tower Ridge called Italian Climb Right Hand (IV, 4). 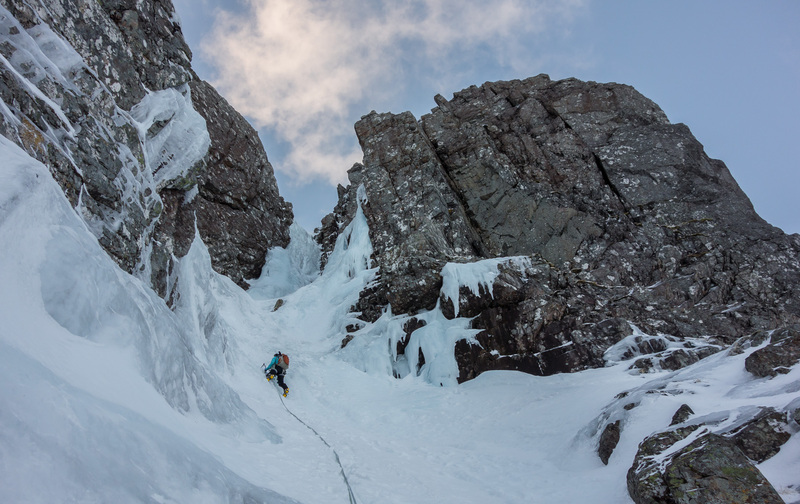 As the name would suggest this climb takes an alternative line to the parent route, avoiding some easy snow-plodding to take in a sustained pitch of quality ice. The ice was again fantastic (a common theme by now) and due to it being less hacked out than The Curtain we both agreed it felt harder despite it’s lower grade. The climb is a good choice for a second route or a short day as a single 60 m abseil from the top of the second pitch lands you back at the base. No photos on the route unfortunately as the weather wasn’t great by this point but it was two very satisfied climbers who made their way back down the path that evening! After a fairly big day we all agreed something a bit more chilled was in order so we rather optimistically walked into Beinn Udlaidh the next morning. 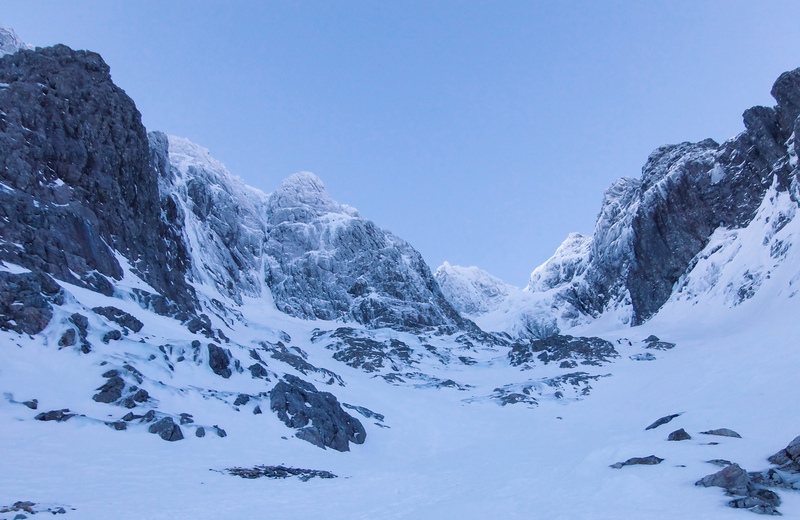 The freezing levels hadn’t been low enough to maintain the classic ice routes and when we arrived in the coire they were all looking a bit dilapidated. 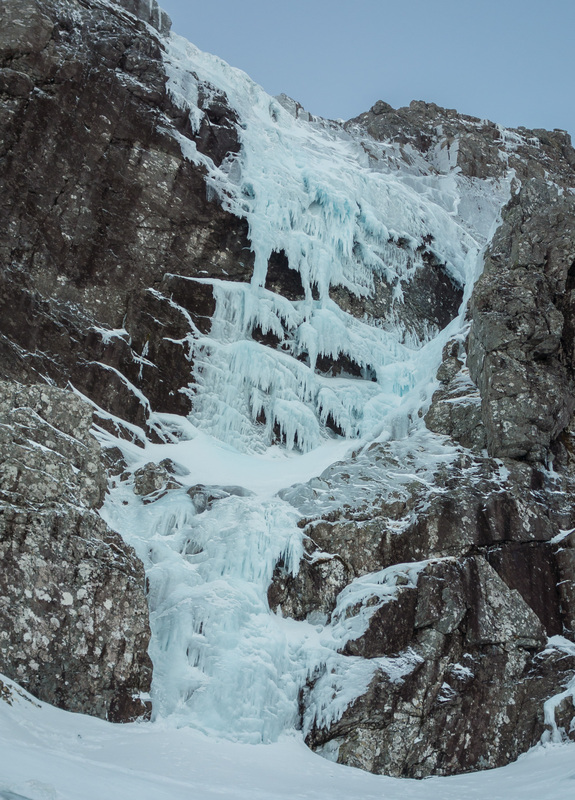 We thought we may have been able to scramble up an easy gully to save the day, but after watching an icefall collapse in front of our eyes we decided sensibly that being anywhere near thawing ice features was a bad idea and so scarpered to the Clachaig Inn for a tasty lunch instead! The weather was decidedly grim the next day and I was knackered after two days on the hill. Debs and I took a rest day and went for a walk in Glen Nevis while Ric and Tom headed back up The Ben for a quick hit on The Curtain. A day off felt like a bit of a cop-out but with much better weather in prospect the next day it meant we could recharge the batteries with a view to going Big! The next morning was clear and frosty and Debs and I once again slogged up the path to the steep side of The Ben, this time with a longer grade V firmly in our sights. I had always been inspired by the ice routes between the North Wall of Carn Dearg and The Castle and currently they are in such great condition that it would have been rude to have walked past them! With the added bonus of an atmospheric approach up the gully beneath Castle Ridge we decided to venture up and take a look. We gazed in awe at the alarming ice features on The Shroud (VI, 6) (which was climbed later that day by another team) before moving around to the base of the classic Boomer’s Requiem (V, 5). I set off up annoying unconsolidated snow before Debs took over for the first pitch proper and brought us to the base of the main event – a steep cascade guarding the entrance to the upper gully. I then led a tactical short pitch and belayed at the base of the crux to give myself a chance to rest while Debs seconded. 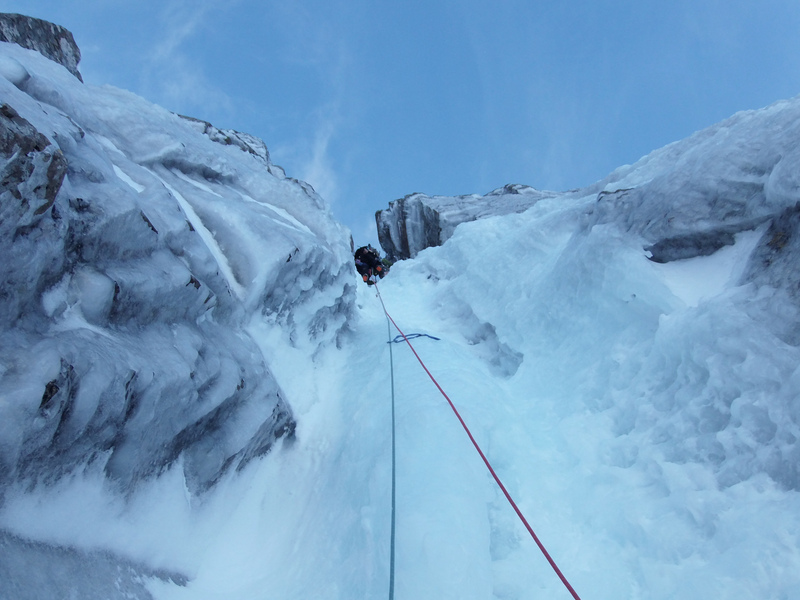 This worked well as I felt pretty fresh as I made the moves up and left into the vertical groove defining the left side of the icefall. It wasn’t long before the pump set in though and I had to work hard to maintain a safe level of tiredness while still placing ice screws for protection. Thankfully the ice was very chewy and while some of the screws were of dubious quality the axe placements were easy and solid, allowing me to make steady progress. As the angle eased slightly I thought it was all over but a nasty sting in the tail manifested as a section of thin, brittle ice over rock. This necessitated a long swing out to the right and by now, well above my last piece of protection, a committing series of moves to gain the sanctuary of the snow field above. Enjoying the steepness while the ice was still thick and chewy! 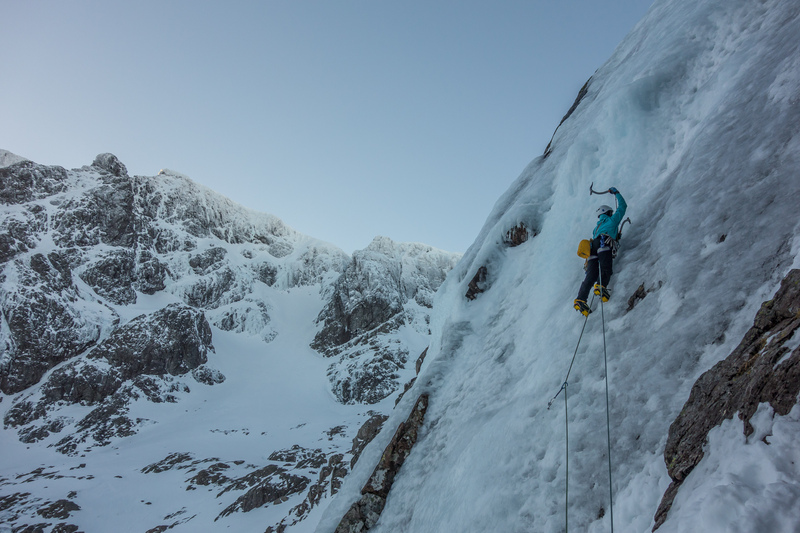 Debs continued up another ice pitch to gain the easier upper reaches of the route where we had to make a decision – a variety of finishes are possible ranging from joining Ledge Route or climbing one of the summit gullies on Upper Carn Dearg Buttress. Instead we decided to follow in the footsteps of a team who had come up along side us and headed right up an easy gully to what we hoped would be the top. As it turned out this way was considerably longer than it appeared and after a couple of rope lengths of moving together we belayed a few more icy steps before finally emerging on to the plateau, after what we estimated was close to 500 m of climbing in all! Having only one hour of daylight left we hastily headed due west, happily dropping out of the cloud quite quickly and descended the never-ending snow slopes of Carn Dearg to the half-way Lochan and thence the path. A very satisfying, but very long day! While we were battling up Boomer’s, Ric and Tom had made the inspired choice of taking the Nevis Range gondola and ski lift up to the top of Aonach Mor for a look at some of the routes on the East Face. 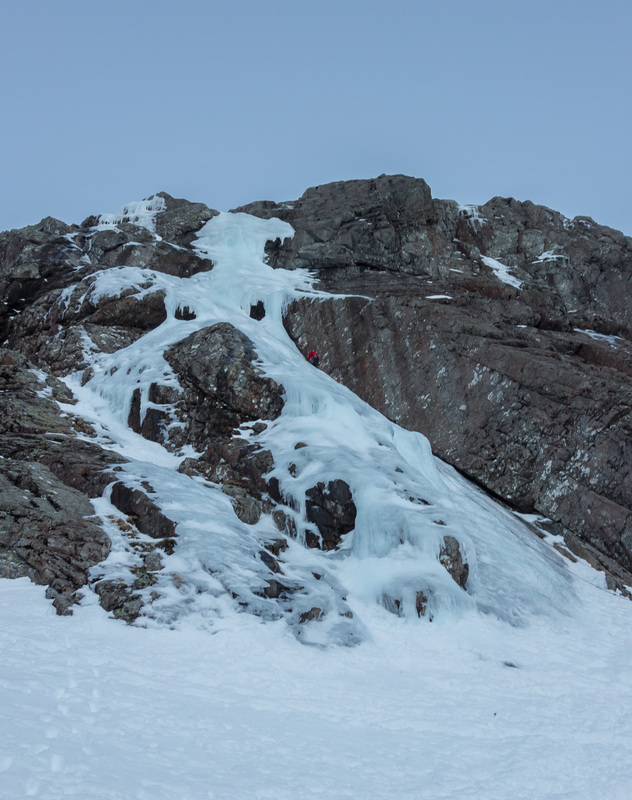 After an aborted attempt on Typhoon (IV, 4) due to very brittle ice, they made a swift ascent of Left Twin (III/IV) which they both agreed was a fantastic route in great condition. 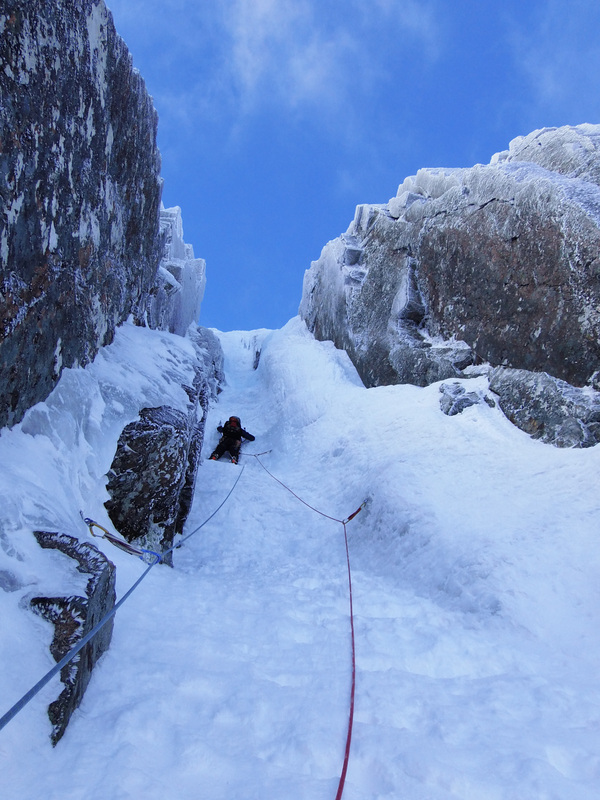 So a great couple of days climbing on the west coast – here’s hoping there will be many more before this season is over!